CEDAR RAPIDS, Iowa – At an MLB First-Year Player Draft lacking a consensus No. 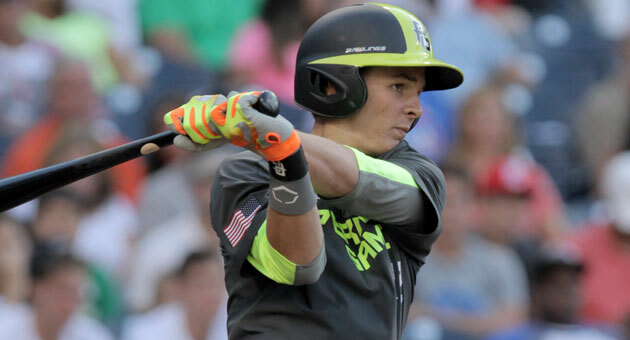 1 overall pick going in, the Philadelphia Phillies on Thursday decided to go with young and burgeoning star power and used the top pick to select San Diego-area high school outfield prospect Mickey Moniak. Moniak, a recent graduate of La Costa Canyon High School who calls Encinitas, Calif., home and celebrated his 18th birthday May 13, is the third San Diego-area prospect taken 1-1 (first pick-first round) in the MLB Amateur Draft since 2009, and the fourth from Southern California. San Diego natives Stephen Strasburg (Washington Nationals) and Brady Aiken (Houston Astros) were the top picks in 2009 and 2014, respectively; Newport Beach, Calif., native Gerrit Cole went No. 1 overall to the Pittsburgh Pirates in 2011. The selection marks the 13th time in the last 14 years a former Perfect Game prospect has been chosen No. 1 overall, dating back to Delmon Young in 2003 (Tampa Bay Devil Rays). Moniak becomes the eighth alumnus of the PG All-American Classic and the sixth alumnus of the PG National Showcase taken with the draft’s top pick. He joins Matt Bush (San Diego Padres, 2004), Justin Upton (Arizona Diamondbacks, 2005), Tim Beckham (Tampa Bay Rays, 2008), Bryce Harper (Washington Nationals, 2010), Gerrit Cole (Pittsburgh Pirates, 2011), Carlos Correa (Houston Astros, 2012) and Brady Aiken (Houston Astros, 2014) as former PG All-Americans selected No. 1 pick. A 6-foot-2, 190-pound primary centerfielder with a 90 mph outfield arm and 6.5-second speed in the 60-yard dash, Moniak is a veteran of 18 Perfect Game events, including appearances that produced perfect 10.0 PG Player Grades at both the 2015 PG National Showcase in Fort Myers, Fla., and the 2015 PG All-American Classic in San Diego. He was named to the Top Prospect List at the 2013 Sunshine West Showcase, his first PG event. He was also named to the TPL at the 2014 PG Underclass All-American Games and the 2015 PG National, and received all-tournament team recognition at five PG WWBA events, all while playing with the prestigious San Diego Show organization. Moniak, ranked the No. 6 overall prospect in the national class of 2016 and a UCLA signee, enjoyed a terrific senior season at La Costa Canyon HS, one that ended for the Mavericks with a 23-7 record after a pair of losses at the CIF San Diego Section Division-I playoffs. Moniak slashed .476/.540/.942 and counted seven home runs, 12 triples and four doubles among his 50 hits; he drove in 46 runs, scored 40 and stole 11 bases. In total, 74 of the 77 (96 percent) players selected on the first day of the 2016 MLB Draft (top two rounds) had previously attended a Perfect Game event. 15 Perfect Game All-Americans were selected in the first round of the draft, 11 of which participated in the 2015 Classic. Twenty-four total PG All-Americans were taken on the first day of the draft, 15 of which played in 2015. In addition, 21 of the first-round picks had previously attended a PG National Showcase, with 19 more National alumni being taken in round two. Nineteen PG All-Americans were drafted on the third and final day (rounds 11-40) of the 2016 MLB Draft, bringing the total to 57.